Leading AI-based medical imaging solutions provider Oxipit received the CE mark for ChestEye radiology imaging suite. Oxipit ChestEye provides analysis and preliminary reports for 75 most common radiological findings – the largest scope of diagnosis currently available on the market. The CE mark ensures that the software complies with medical device regulations and greenlights commercial deployment in 32 European countries. FDA application is also on the company’s roadmap. “The year 2018 marked the coming-of-age of AI-based medical imaging research. The technology has proven itself in real-world trial applications and is ready to be integrated into routine work of hospitals and clinics. In 10 years we will see more than half of EU and US medical institutions running a version of AI-based medical imaging solution in their radiology department workflow” – notes CEO of Oxipit Gediminas Peksys. Oxipit ChestEye encompasses a fully automatic computer aided diagnosis (CAD) platform. The solution is able to discover 75 radiological findings on a chest X-ray, localize and describe them just like a human radiology specialist. The ChestEye suite also includes a patient prioritization module. After receiving a radiograph, the platform prioritizes potentially unhealthy patients inviting urgent specialist attention. By automatically arranging scans by urgency it reduces time-to-treatment for time sensitive conditions. 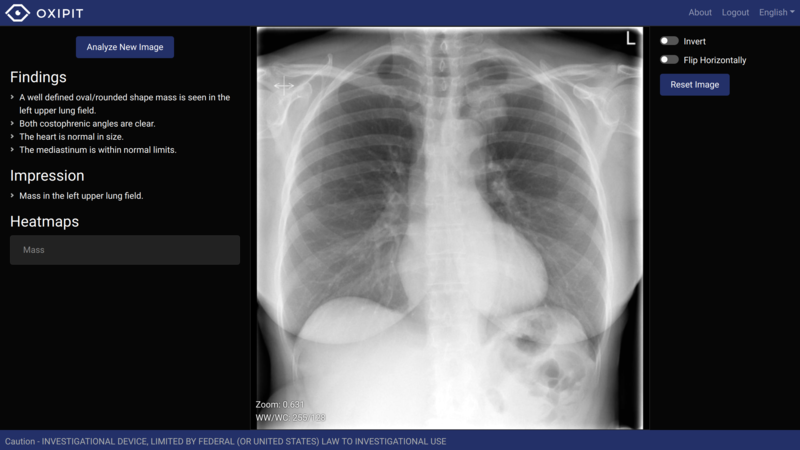 The Search module of ChestEye incorporates a search engine for finding similar-looking chest X-rays in a given database empowering the user to quickly find retrospective cases with similar radiological appearance. “ChestEye currently covers over 90% of radiological cases presented to radiologists on a daily basis. It aids the specialists to detect hard-to-catch edge cases and offers a second opinion. In addition, the automatic generation of standardized medical reports significantly increases productivity of a radiologist, allowing more time for radiogram analysis and less for case description” – notes Gediminas Peksys. According to the results of Oxipit trials, the software operates with an average area under curve metric of 93% and has produced 30% time savings per patient as well as reduced error rate by up to 50%. “A common scaremongering trope of previous years was for AI to replace human radiology specialists. This is absolutely not the case. Our solution aims to assist radiologists in their daily routine. It allows to streamline work, improve efficiency, offer a well-informed second opinion and better manage the workflow of a radiology center. An AI-based medical imaging solution serves as a productivity tool and a technical assistant for better decision making – in a similar fashion as X-rays or MRI scans did when they were first introduced” – notes Gediminas Peksys. Oxipit is a computer vision software startup specialized in medical imaging. With a team of award-winning data scientists and medical doctors, the company aims to introduce innovative Artificial Intelligence/Deep Learning breakthroughs to everyday clinical practice. Oxipit are the authors of CE certified multi-award winning ChestEye radiology imaging suite.